Sometimes you wonder. Back in 1988, an IRA unit composed of Danny McCann, Sean Savage and Mairead Farrell were shot dead in Gibraltar. They were planning a bombing mission but at the time of their killing all three were unarmed. But that wasn’t the story that was put out: officially, they were three deadly bombers who made moves which led the British team which killed them to fear for their lives. Did the publicly-funded BBC, renowned throughout the world for the impartiality of its news reporting, push further into this version of events and discover the truth? Nah. That was left to Thames Television, a commercial station. Their ‘Death on the Rock’ showed conclusively that all three were executed while unarmed. Which brings us to this weekend. 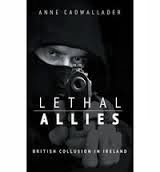 The former journalist Anne Cadwallader, who was a researcher with the Pat Finucane Centre in Derry, has produced a book called Lethal Allies. In it, using detailed and irrefutable evidence, she shows how time and again members of the RUC and UDR were involved with the killing of over 100 innocent Catholics in what was known as the Murder Triangle. You may respond with a shrug and say “So what else is new?” Rumours of ‘security’ force collusion have been rife for decades. The difference is that Cadwallader has checked and rechecked and footnoted in detail her sources for claims and there’s just one conclusion you can come to (providing you’re not Jeffrey Donaldson, that is): the deadly work of loyalist murder gangs was at best given a green light by the authorities and at worst was actively assisted by them. There’s even a case of a policeman who was involved in a murder hurrying back to his desk so he could take a statement about the killing from a witness. A few rotten apples? Read the book and see if that’s what you still think. According to Cadwallader, what was going on was given a nod and a wink by people at the very top of security and government. Read and weep. And weep again that it takes individual journalists like Cadwallader in conjunction with the Pat Finucane Centre to dig up the buried evidence. Where was the BBC? Where was our mainstream media, north and south? Pass. So how many policemen were involved in this gang? I thought that Suzanne Breen had covered some of the same territory in her articles over the years in the now defunct Sunday Tribune. I’m surprised Jude that you omit the fact that BBC Northern Ireland’s Spotlight strand made a highly controversial film that questioned the official version events of the SAS killings in Gibraltar. The programme was broadcast on 5th May 1988 and was cited as one of the reasons for the Broadcasting Ban later that year. Following on from that Spotlight made a number of important films about collusion. I’m also surprised you don’t mention my book “A Very British Jihad”, which was published in 2004 but is now out of print (available on Kindle). This book is now used as a reference text on collusion in courts of law and in universities. Where was the disgusting Seamus Mc Kee?I listened to him on radio the other day trying to compare it with IRA violence. All this shite about the security forces being stretched and a few bad apples, so why innocent catholics?, could it be that the forces of law and order were sectarian from the start? Unlikely, or the security forces wouldn’t have had such disproportionate success against loyalists. More likely they were infiltrated by loyalists in Armagh and found some sympathetic cops. You are competely wrong about the BBC, Jude, as it broadcast its own investigation into Gibraltar during the same week as Death on the Rock went out on Thames. Roger Bolton, editor of This Week, which produced Death on the Rock, acknowledged this in his book on the subject and said that, if anything, the BBC Spotlight programme went further than Thames in its reporting. It was only screened in Northern Ireland but it is amazing that you are unaware of the massive controversy it generated. All the main newspapers were also covering collusion issues for decades, so the evidence is that the only glaring lack of research here is on your part. Madraj55 The lack of any unionist politicians being quizzed on this on mainstream news isn’t any surprise to nationalists as the BBC news editors desk has too many pals in DUP and UUP. UTV used to have an investigative series called Insight, but pennypinching saw it replaced by the ultra unionist UTV late news which is positively aneamic most of the time. If memory serves me right,didn’t B B C’s Spotlight programme cover aspects of the Glennane gang’s activities.I can’t believe that M/s Cadwallader is the only journalist to investigate all the outrages.She may be the only one who has had access to all the relevant H E T reports.You presumably have the advantage of having read the book.The rest of us will have to wait until it becomes widely available . How many security forces were involved in this? How many loyalists were successfully pursued by the police? Was there something unacceptable about the comment I posted this morning ? If I’ve maligned BBC Spotlight for their good work, my apologies. I do have memory gaps, I confess. At the same time, I have a clear recollection of the impact ‘Death on the Rock’ from Thames TV made. Why is that, I wonder? Were the programmes identical? Different emphases? Anyway, if they did work of the quality of Thames on that occasion, I apologise for my ignorance/forgetfulness. Ditto re Spotlight’s work on Glennane gang. But if they did such work, why is it that her book is drawing such attention now? She does include HET material but it’s only a part of her reports. Jude, you did not malign the Spotlight programme, you forgot that it had ever been broadcast in your haste to condemn the BBC and the daily newspapers. Given the attention paid to Spotlight’s 40th anniversary within the last week, and the specific references made to the Gibraltar special edition, it was a fairly glaring oversight. `Memory gaps’ are hard to sustain after the invention of Google. Surely a little basic research is in order before you dismiss the record of journalism in Ireland, north and south. Kevin – as someone said about a public figure who was modest, ‘He’s got a lot to be modest about’. The BBC and the daily newspapers, north and south, are not in my considered opinion at the forefront of anything that might make republicanism look good; and I repeat,Thames TV’s programme was the one that got my attention – and I suspect an award for its work as well. Of course, it could have been Spotlight got it – you can always google and check. Why should the B B C be in the forefront of making republicanism look good?Surely that’s the job of Sinn Fein.You seem to suggest that a publicly funded broadcasting service should operate at the behest of your favourite political party. Kevin – I don’t think Jude is dismissing the record of journalism in Ireland. What he is pointing out, is what Paul Larkin (A Very British Jihad), already consistently demonstrated; namely the existence of an unbreakable umbilical chord between the British state, its intelligence services and the ‘murder gangs’ it sponsored to kill catholics and republicans in the North for over 30 years. The proverbial ‘dogs in the street’ knew about these things, and I’m old enough to remember issues which journalists failed to examine and report, because they were too ‘politically toxic’ and reached right into the heart of government and the so called ‘Royal Elite’. Stories on Kincora, murder gangs and shoot to kill never paid anyones’ mortgage, but a mass dereliction of duty,by MSM journalists, with a few courageous exceptions, is the affliction we all had to endure (and still do) during these years. So try not to go on spouting about the impeccable credentials of Irish journalism, and lambasting Jude for an understandable oversight. Perhaps try reading Annes’ and particularly Pauls’ book and learn just how short of the mark, journalism and truth really were, during these turbulent years. Anon 14:43 – I don’t ask the BBC or anyone else to make republicanism look good. I’m just struck by the almost unanimous tone and content of the mainstream Irish media north and south. I could reel off half-a-dozen journalists who are hostile to republicans. With the obvious exception of Jim Gibney, I can’t think of any prominent journalists who have a good word (even occasionally) about SF and republicans in general. Why not name those journalists who are”hostile to republicans”? I haven’t noticed that you have been reticent in appearing on B B C radio or TV in recent times. Look forward to Anne Cadwalladers’ next book in which she outlines collusion between the State and individuals such as Denis Donaldson and Freddie Scapiticci .We might have to wait a while on that one .Mightn’t please her colleagues in the Pat Finucane Centre!! This statement is clearly incorrect.It’s also doubly surprising because you were in and around BBC Northern Ireland when I was there (late 80s/early 90s). Best just to admit that you got it wrong. Where my book “A Very British Jihad” is concerned, you are the first Irish collusion commentator, to my knowledge, who has never heard of it. ‘This statement is clearly incorrect’ – that would depend on the content of the Spotlight programme, wouldn’t it? You may experience whatever emotion you wish but I don’t recall that Spotlight programme with the clarity I do ‘Death on the Rock’. I was indeed around the BBC at the time but I never got to move in the more rarified air of the news department. In any case, I think it might be a good idea for you to not try making judgement as to what I should or should not do. I do remember you making programmes about loyalist paramilitaries and being very impressed by your courage in so doing – if I didn’t congratulate you on that then I do now. But as to your book, I’m afraid it’s just another gap in my reading knowledge. I’ve written six books and you’d be amazed at the number of people who’ve never heard of any of them, so maybe don’t take it personally. If you write a blog and some of the facts therein are shown not to be fully accurate ,are other folk such as Paul Larkin not entitled to make an appropriate comment. You seem a little touchy when someone dares to criticise your recollections! Jude – thank your for your reply. We will obviously agree to disagree and there let it be. Im sure Ms S Breen is already at work to fulfil your wish of a book with a suitable anti SF slant.Im not sure if the facts will be as verifiable however. Paul, I think your book is probably one of the best expose’s of state collusion in the six counties ever published, but I can understand Jude missing it. I only discovered it on Amazon a couple of years ago whilst researching something else. It certainly didn’t achieve the MSM fanfare that Annes’ did last week,…….which makes me kinda wonder……are they preparing the groundwork for the soft landing of something more? Interesting article by Fionnuala O’Connor in today’s Irish News about the book and the wider context.The last paragraph states “This painstaking book shines more light on darkness .Recognition of how I R A killing inflamed hatred would have made the light clearer again.Indeed!